The Jen Library at the Savannah College of Art and Design is certainly one of the most exquisite libraries on any college campus throughout the South. In fact, Savannah is certainly one of the most exquisite towns in the South, so it is no surprise that this art school's library, which resides in a renovated department store, should be as artfully designed and aesthetically pleasing as the surrounding homes and shops. 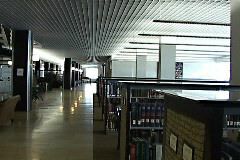 The library occupies an 85,000 square foot building, and houses about 42,000 books, 11,000 bound volumes of periodicals, and more than 1,600 videotapes. 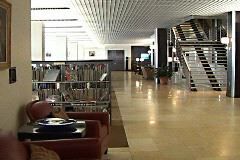 The library is open to students and the general public. 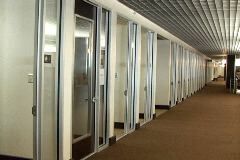 The renovation was a $7 million project, and was completed in May of 1999. The design theme of the interior is based on the aesthetics of an Italian cruise ship of the 1940's. Student artwork hangs throughout the building, and the library hosts competitions among sculpture students, and these pieces are displayed throughout the library as well. 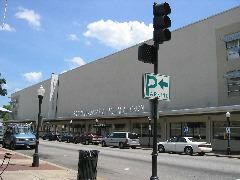 The building itself was built in 1890, and had been home to about 5 separate businesses before SCAD bought and began renovation of the building in 1996. As Julia was doing her research, she was surprised when she reached the Jen Library. She had heard during her research that the Jen Library was in a renovated big box building, so when she arrived to see that it was actually in such an old beautiful building, she realized it was not the one-room warehouse she was expecting. 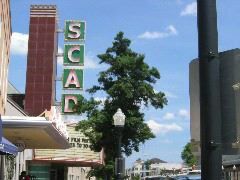 Nonetheless, her research in Savannah and with the Jen Library led her to understand more about downtown revitalization, and the idea of shifting civic centers, which is all very relevant to the big box phenomenon. As big box centers and "exit communities" on the highways flourish, downtowns are often left empty. In the town of Savannah, which is known for its beautiful architecture, we see adaptive re-use of old buildings at its finest. 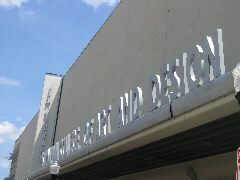 The Savannah College of Art and Design occupies more than 50 buildings in the historic downtown district of the town.